As I look eastward out my window in the morning, I have a host of birds that entertain and intrigue me–mockingbirds, wrens, crows, the busy hummingbird quite in love with the fig tree next door, who drops in often, and if the wind is right, seagulls come screeching through. One morning we were even visited by an adolescent hawk, resting mid-flight on her way to somewhere. But even in our temperate climate, there seem to be fewer birds aloft than in spring and summer months. According to the carol, the Advent task is guarding the nest that must be filled. This week my heart longs to know how to guard and protect the nests for the little ones in our world who are at risk. We are closely connected to our neighbors in the east in the towns of San Bernardino and Redlands. Beyond the colleagues who were slaughtered last week, I am in grief for the children whose nests have been permanently upended because of that day–the 6 month old child of the shooters, the little ones who were left without a parent after the shooting, the learners who endured hours of lock down while the sorting out process continues, the neighborhood gaggles of young people who now have been close up and personal to the effects of terror. How am I called to be a protector of nests and the ones who inhabit them? I am reminded again and again how in both testaments of the Bible, there is a call to protect, to care for, to be advocates for the widows and children. A friend here is part of an interfaith coalition of people who are are becoming advocates for undocumented immigrant children shipped in from the border, awaiting in warehouses for the judicial process to grind its wheels. And I support with energy the many gatherings of faithful ones who labor at feeding the hungry children, housing the homeless ones and providing for the well being of so many vulnerable ones. In the movie “Mary Poppins” the most poignant plaint is from the Bird Woman on the steps of St. Paul’s Cathedral, singing “Feed the birds, tuppence a bag.” How am I to feed the birds this Advent? The promise is that Love, the Bird is on the way this Advent. In a very provocative book, Consider the Birds, pastor Debbie Blue writes about the appearances and meanings of birds in the Bible. Some are metaphors, some are illustrations, some are even names for the Holy One. When I am praying for Love, the Bird, to come quickly, I have in mind one not named in Scripture, but one from the Celtic tradition, who is the symbol for the Iona Community, the Wild Goose. I am told by members of that community that she was chosen as a symbol of the Holy Spirit; they were drawn to her because the wild goose is known for going where it will, like the Holy Spirit, and sometime it makes what seems to us to be a great mess. Certainly I don’t know how and when the Spirit is coming among us, but I believe she will, and I feel sure that in guarding the nests of the little ones, some neat and tidy ways of societal organization might be left in a mess. Even so the Spirit and the Church cry out: Come, Lord Jesus! The whole creation pleads: Come, Lord Jesus! And meanwhile, I am paying attention to the places where I can guard the nests that need filling and care and feed the little birds that are here in this world. All of my life of the Spirit takes place in my body planted in the physical world where I am rooted. As much as I would love to waft far and away above earth’s lamentations, I find myself often, much like Winnie-the-Pooh floating with his balloon, being thumped along the cold and bumpy ground, because I am a human being in a created body that is made of dust, and to dust I will return. My intention to be peace is interrupted by an urgent phone call from a neighbor needing assistance. My vision of resting in the Spirit gets cluttered with the trash that the dog has strewn all over the back yard. My song of praise is cut short by the sounds of sandblasting next door. My prayers intended to be incense rising are more often overridden by the stench of garbage spilled on the sidewalk. My words that I crafted to be like apples of gold is a setting of silver are drowned out by the yammering rhetoric of both public and private pundits of politics. How do I keep my attention on the Holy when there is so much that might distract and divert it? My new drought-resistant garden has been a teacher to me about my earthliness this season. Its variety and its beauty are continual surprises each morning, but not all the surprises are welcome ones. 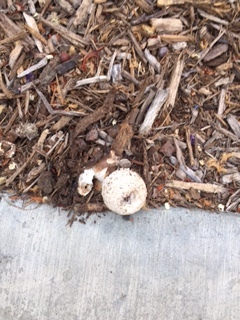 Suddenly one morning, a year after the lawn has been taken out, all the earth in the front yard has been replaced, completely new plantings have taken root, I find a wild invasive mushroom blooming. It is not edible, nor is it useful; it was not what I wanted, but there it is. It needs to be removed. Attention must be paid! The garden is not Eden, it is made from dust, as I am, and not everything that grows there is beautiful or necessary. 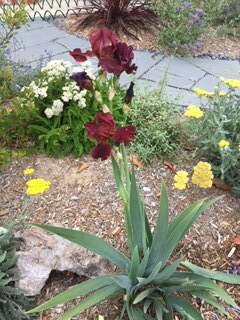 I turn aside to take care of it before I continue to glory in the beauty of the irises that proliferate. Maybe this is the next teaching: the same earth that spawned the mushroom also provided the nourishment for the fabulous flowers! The spiritual lesson is to be awake, attentive, and discerning. What is mine to notice? what is mine to act on? what is mine to savor and thank God for? what is mine to prune, to tend and to water? I find I need to be more mindful; I cannot just send up a prayer and hope it all turns out right. My spirit need to act in concert with my hopes and dreams. In these freshly troubled days of reflection after the murders at Mother Emmanuel Church in Charleston, SC, I am asking myself what and how do I need to act in order to contribute to a cessation of violence and hatred in this country. Every sound bite I hear, every op-ed piece I read, every pastoral letter I receive offers a different piece of advice. The fabric of this world, this nation, our people is so tattered and torn. I am brokenhearted and baffled. So I am back to the discerning prayer until Wisdom comes. I also am reminded too that I am earthen–we have this treasure in clay jars (2 Cor.4:7)–and I am limited, fragile and imperfect. So The Solution to the Evils in the World does not rest on me alone. The discerned actions that I will be led to take will be ones that participate in the clarification that it is God who is able to do more than I can believe or imagine to redeem this crisis, both the immediate one in South Carolina and the deeper, more tragic sin and brokenness that springs out of this evil in the world. So we do not lose heart. As I wend my way though the dusty paths I am called to wander today, I pray for compassion, for wisdom, for courage, trusting the Word of the Holy, that what is required is that I be faithful to the call of Christ to be just and to be merciful, and to be creative, discerning and energetic in living out my earthbound journey of Spirit.